Air-drying works well if you are going to use the timber to build a house. But you can’t rely on the spring winds to dry it enough for use in furniture. ”It’s the biology that means furniture timber has to be dried artificially,” says Svante Larsson, who together with Leif Mattsson came up with the Sauno wood kiln. Svante is one of the owners of the company Plano System, where Leif works. In a past life he was a high-school chemistry and biology teacher. When Leif showed him the newly built Sauno wood kiln, he used his knowledge of biology and woodworking to examine it closely. ”The principle is far from new and was used by furniture makers as long ago as the 19th century,” says Leif. The difference is that today science can explain how the process works and why the results are so much better. ”The answer lies in the physiology of the tree,” explains Svante. Trees are only alive on the surface, between the bark and a few millimeters into the tree. The rest is dead wood with an automatic function that transports water to the treetop and keeps it in the cells (vessels and tracheids) in a drought. The mechanism continues to work even when the tree has been felled and sawn into pieces. ”A cubic meter of raw, newly sawn timber can contain 66 gallons of water,” says Svante. Air-drying can’t remove all that water. The dead wood reacts just as it would in an extreme dry spell and shuts the water inside it. It doesn’t matter whether you saw it into thin sheets. The solution is to change the cells so that they can’t shut the water inside. This is why the Sauno method begins the process by adding water and heat. The water vapor that is formed then permanently opens the ring pores of the cell. The actual drying process then begins under low heat and since the pores are open, it takes much less time and achieves better results than air-drying. ”The drying time is counted in the same number of weeks that air-drying in heated premises would take years. Drying pine to a 7-9 percent moisture level for use in furniture takes between 3 and 4 weeks. It would take 3-4 years to get the wood down to the same moisture ratio with air-drying,” says Leif. Since the pores are open during the drying process, there is less tension, which leads to fewer cracks. Often there aren’t even end cracks in a Sauno dryer. As previously mentioned, the method is far from new. It was used in the 19th century but was forgotten when industrialization required faster flows. 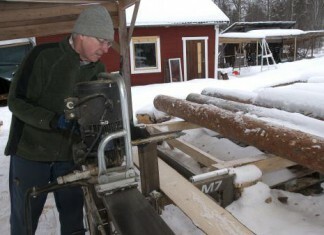 At the large sawmills, drying with moisture and heat has come back into favor, in order to reduce the drying damage. ”Unfortunate the industry uses the method to bring the drying times down too, which doesn’t give the very best quality. That is achieved by doing the drying yourself following the Sauno method,” summarize Svante Larsson and Leif Mattsson.